Select Tools/Account Settings from the menu bar, and Thunderbird will display the “Account Settings” setup. Select Add Account to define a new e-mail account. Select Email account as the account type. “Your Name” should be a descriptive full name associated with the account. 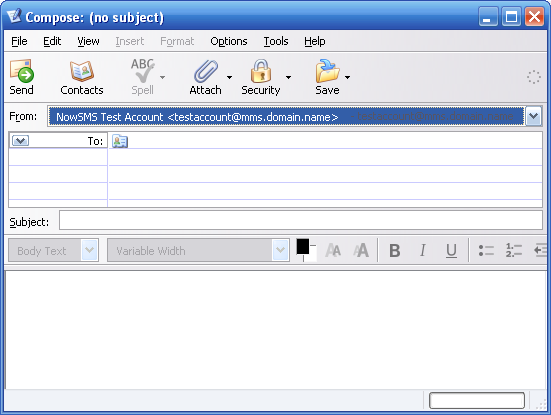 The “Email Address” for the account is the “User Name” defined for the “SMS Users” account @ “Domain Name for MMS E-Mail” as configured on the “MMSC” page of the configuration dialog. Select “POP3” as the incoming server type. Define the IP address or DNS host name of the NowSMS server for both the “Incoming Server” and “Outgoing Server”. 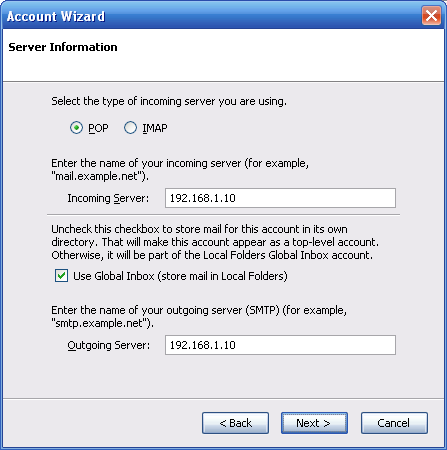 Note that Thunderbird assumes that you are using the standard TCP/IP port numbers for SMTP (25) and POP3 (110). 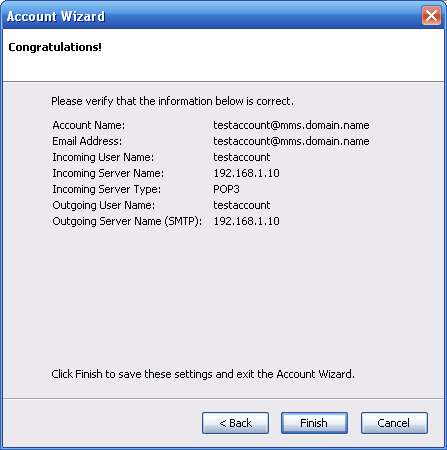 If you are using non-standard port numbers, you will need to perform some advanced configuration steps after completing this wizard. 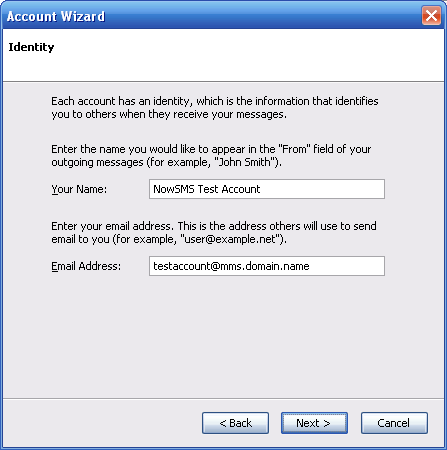 “Incoming User Name” is the “User Name” defined for the account in the “SMS Users” list of NowSMS. 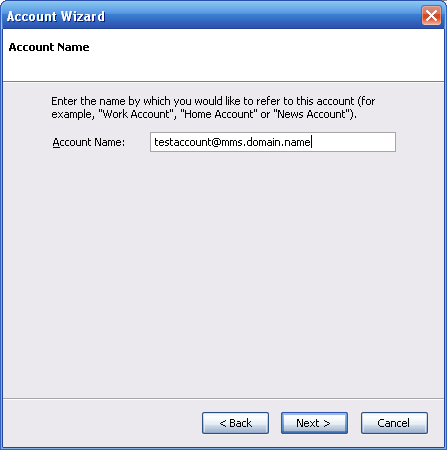 “Account Name” is a descriptive name for the account, which defaults to the e-mail address. This value is only used within Thunderbird. 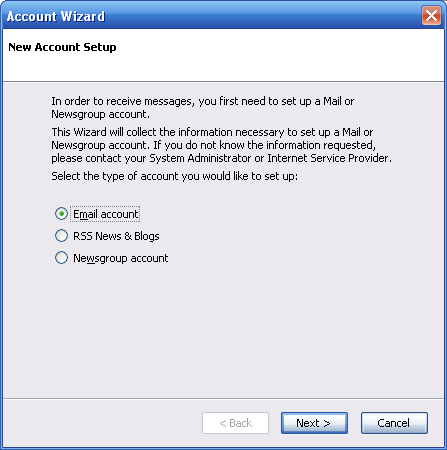 Thunderbird displays a summary of the account settings. Use the “Back” button to correct a setting, or “Finish” to save the settings. 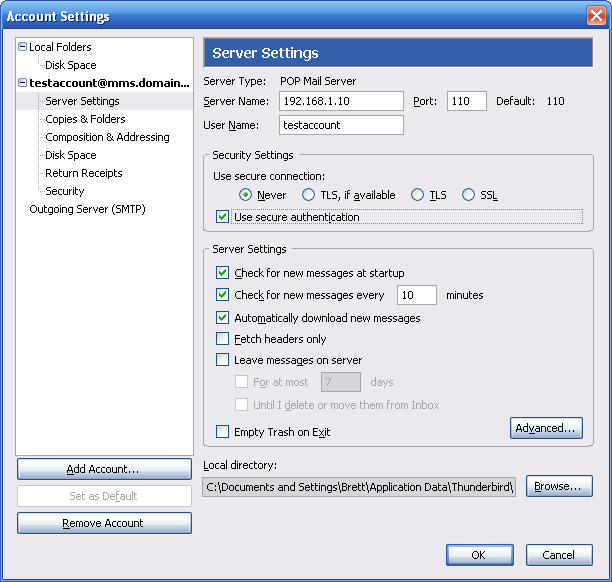 If you are using a non-standard TCP/IP port for the POP3 server (other than 110), it is necessary to edit the Thunderbird account settings for this server connection. 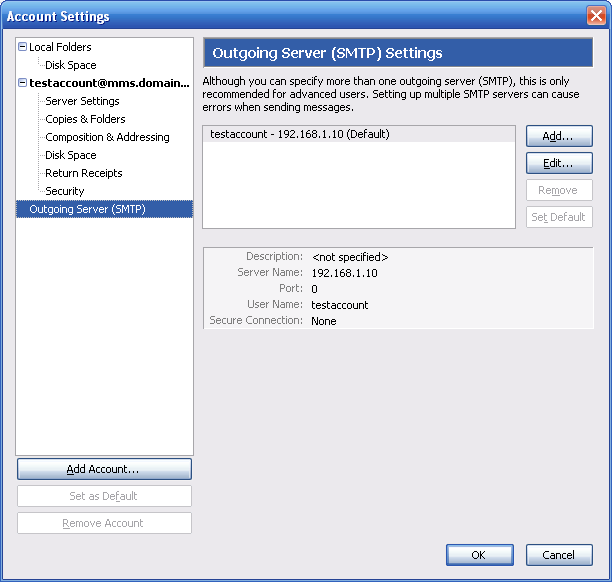 This is performed in the “Server Settings” area of the “Account Settings” configuration, as shown below. It is also possible to check the “Use secure authentication” button to enable the use of APOP for POP3 authentication. 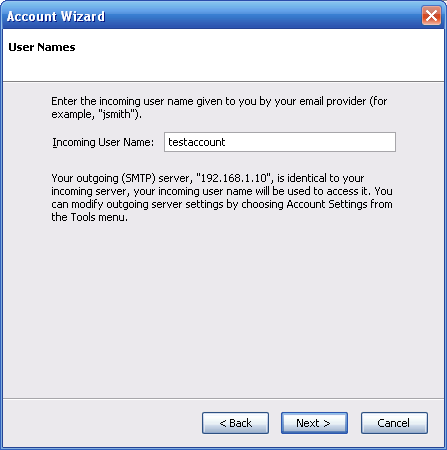 If you are using a non-standard TCP/IP port for SMTP (other than 25), it is necessary necessary to edit the Thunderbird account settings for this server connection. 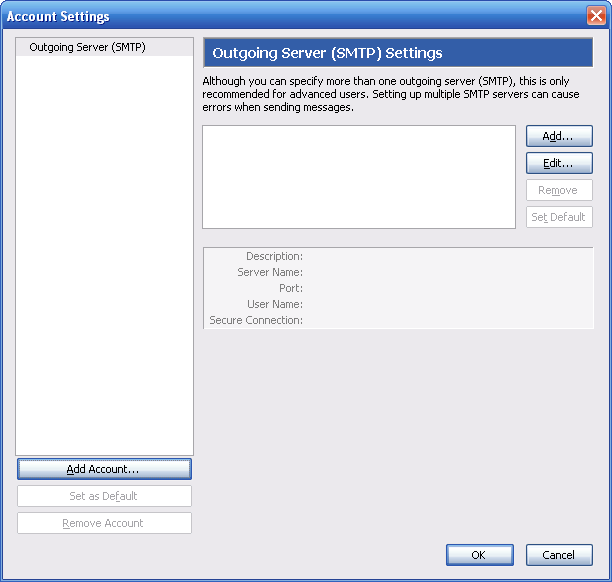 This is performed in the “Outgoing Server (SMTP)” area of the “Account Settings” configuration, as shown below. 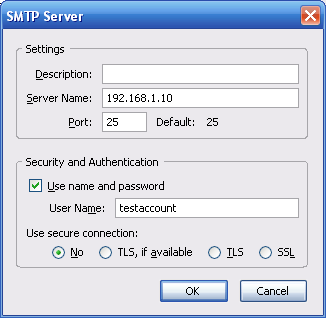 Select “Edit” to edit the settings for the SMTP server, including the SMTP port number. Press OK (several times if necessary) to exit the configuration. To send an SMS or MMS message via the e-mail client, in the “To” field, enter phonenumber@mms.domain.name or phonenumber@sms.domain.name, where the domain name matches either the “Domain Name for MMS E-Mail” or “Domain Name for SMS E-Mail” as defined on the “MMSC” configuration dialog.